I rarely find a children's book to be an unmitigated disaster, but this is one time when there doesn't seem to be anything else to say. It is such a pity-great time and trouble has been lavished on this expensive hardback novelty. Every page is absolutely crammed with wheels, flaps, levers, pull tabs, print, pictures, mirrors, creatures, funny writing and bits of string to the point where the reader cannot tell where to begin, what to read or how to make sense of what s/he sees. 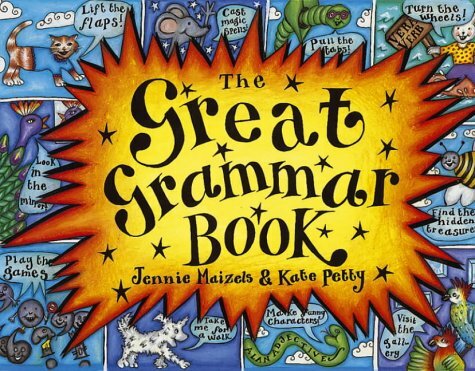 All this chaos is intended, extraordinarily, to teach children the rules of grammar. They are supposed to learn what nouns, verbs, conjunctions and pronouns are from this welter of flashiness and trickery - an odd way of teaching the calm and ordered world of grammar and one that is bound to confuse. In case it was just me being grumpy, I gave this to a nine-year-old to try out (after all the world has changed since I first chanted, 'a verb is a doing word'). He flapped the flaps, opened the doors, turned the wheels, interacted with all the mechanics but read not one word. Having done all the doings he gave it back to me as unaffected by the rules of grammar as before. This is a classic case of form destroying function. If a child is ready to learn grammar she/he can do it without all the tricks; if not, this won't help a bit.